Most viruses that cause global outbreaks of disease come from wild animals. 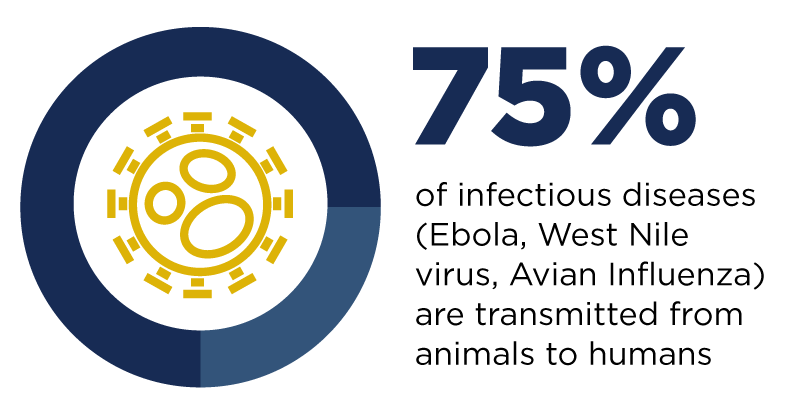 The goal of the PREDICT Project, housed at UC Davis in the School of Veterinary Medicine, is to identify viruses in animals that have the potential to transfer to people before they spread to humans. But that’s a big effort, so how do they do it? The short animated video above, narrated by One Health Institute Lab Director Tracey Goldstein, gives a glimpse into how a low-cost testing works and why it's so valuable. This type of testing is called cPCR, or consensus Polymerase Chain Reaction. It is both affordable and possible to perform in countries with limited lab resources. PREDICT, which is led by the UC Davis One Health Institute and funded by USAID, has used it in more than 30 countries around the world. Most approaches to viral discovery are extremely expensive and available only in sophisticated labs with teams of laboratory technicians. Because PREDICT's work takes place in some of the most resource-constrained countries, a cheaper, simpler technological alternative fits its needs. Justin Cox is content marketing manager for the UC Davis One Health Institute and the Karen C. Drayer Wildlife Health Center. He has a passion for storytelling about animals, people and the environment.